Detailed in an Apple document circulated to Authorized Service Providers last month, the modified repair procedure requires proprietary "system configuration" software to be run after certain hardware components are replaced. Called Apple Service Toolkit 2, the program works in conjunction with Apple's T2 security chip, present in the 2018 MacBook Pro and iMac Pro. The suite includes the Mac Resource Inspector and tools that examine a variety of computer systems including memory, display, power adapters and cooling system, the publication said, citing the repair document. To ensure only authorized personnel are using the toolkit, Apple requires authenticated access to its Global Service Exchange (GSX) network. 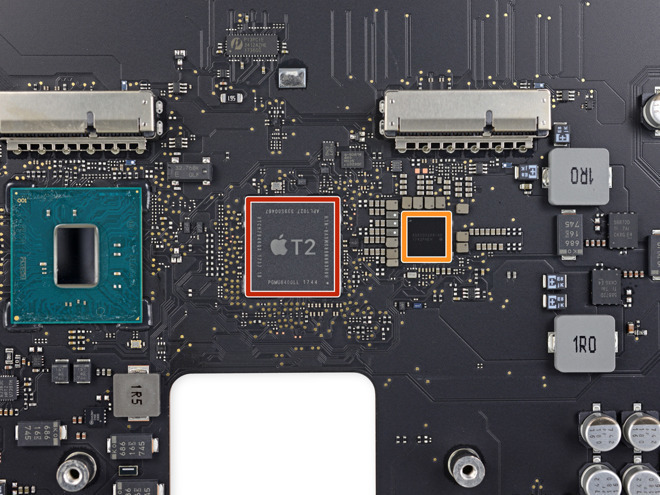 "For Macs with the Apple T2 chip, the repair process is not complete for certain parts replacements until the AST 2 System Configuration suite has been run. Failure to perform this step will result in an inoperative system and an incomplete repair," the internal document reads, according to Motherboard. The software is restricted to Apple Authorized Service Providers, meaning Apple has effectively blocked third-party or at-home repairs of major components. Not all hardware modifications are pursuant to the new policy, however. According to the publication, repair facilities must use the software when replacing a MacBook Pro's display assembly, top case, logic board or Touch ID board. The same is required when swapping out an iMac Pro's logic board or flash storage, the latter being particularly problematic for users looking to expand onboard capacity. Word of the new protocol is likely to renew suspicions of "planned obsolescence" strategies, as Apple, and only Apple, is in control of T2-bearing Macs repairs. The company can, for example, discontinue repair support eligibility for said machines when they reach end-of-life, thereby forcing customers to buy a new machine. Apple's policy is also sure to stoke concern with advocates of so-called "right to repair" legislation being readied in a number of U.S. states. The laws seek to force tech companies like Apple to provide consumers and third-party repair outlets access to repair information, diagnostic equipment and parts. Whether Apple can retroactively revoke AST 2 policies via a firmware update is unclear, but the operating restrictions hinge on the T2. Introduced with iMac Pro, the Apple-designed silicon integrates multiple system controllers, including those governing audio and SSD drives, as well as Mac's image signal processor onto a single chip. As part of its mass storage management duties, the T2 encrypts and decrypts user data. Additionally, and germane to the AST 2 repair policy, the chip validates the entire boot process. The repair document was first spotted by MacRumors. AppleInsider has confirmed the authenticity of the report.